Welcome to a new year on my blog! My post yesterday talked about the year that just ended - this one will focus forward, on the one to come. The year 2014 was the first one when I chose a single word to focus on (and, by the way, didn't bother to talk about it in a blog post), and it was very good for me. Because of that, (and because the Lord nudged me in this direction!) I have selected a new word to focus on for 2015. I actually had a different word (Steady) chosen a week or so ago, but then God changed my word this past Sunday during our Adult Bible Fellowship. My hope is that my focus word will help me draw closer to my family, the Lord, and maybe even my goal of being a published picture book author. So, there you have it! My one word focus and four goals. And now - onward! 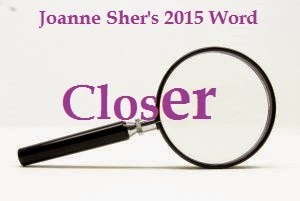 Do you have a word, or goals, for 2015? I love, love, LOVE your new word, my friend! And yesterday...you can't fix a blank page...wow! That was a slap in the face to LIVE! Closer indeed, blessings. Thanks, Ann! :) Love you!